Prior to European arrivals, this area was inhabited by the Algonquin. A nomadic people, they hunted, trapped and fished while traveling throughout the area. When Lanark County was opened to settlement, British Upper and Lower Canada had existed for less than sixty years. The War of 1812-14, with its Canadian battles fought along the Great Lakes and St. Lawrence areas, was at its successful conclusion. A need and opportunity for resettlement had arrived. Beckwith Township was surveyed in 1816.The Township was named after Sir Thomas Sydney Beckwith (1772 – 1831), Quarter Master of Canada between 1815 and 1823. About twenty 100-acre land sites were granted that first year, mainly to English soldiers. ​The first large influx of settlers came in 1818 with the arrival of Scottish Highlanders. By 1822, Beckwith Township had a population of 1,000, and two hamlets, the village of Franktown and what is now the town of Carleton Place. In September 1819, settlement rights were issued to Irish immigrant Edmond Morphy and his adult sons. Their land became the central core of what is now Carleton Place. Adjoining land was allotted that same year to William Moore and family, also from Ireland. Known as Morphy’s Falls, the settlement grew around the falls on the Mississippi River, with a grist mill in operation by 1820. The community became known as “Carlton Place” in 1829, a name chosen by local merchant Alexander Morris, after a public square in Glasgow, Scotland. 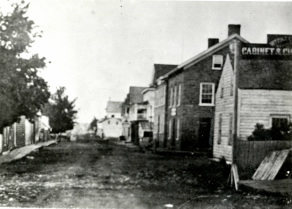 In 1830 the village acquired a post office with the name “Carleton Place”. Lumbering was the first industry, with Ottawa Valley white pine trees being felled and sent down river to sawmills constructed along the Mississippi River at the village site. The village grew rapidly with services to support the lumber industry, and by 1857, the Brockville and Ottawa Railway served the community. Textile mills were constructed producing woolen goods, machine shops manufactured iron engine parts and boat motors, and in 1862, David Findlay opened an iron foundry, later Findlay’s Limited, which would go on to produce stoves and furnaces for over 100 years. Carleton Place was incorporated as a village separate from Beckwith Township in November of 1870, and then as a town in 1890. The 1880s and 1890s saw a large growth in population, services and building construction. The town is home to some remarkable historic properties, many built of local Beckwith limestone, including the Carleton Place Town Hall, built in 1872 on the bank of the Mississippi River. With the meeting of the Canadian Pacific and Canadian National Railways tracks, the town became a railway hub, and the CP Engine Repair Shops were located here in 1890. Residents have always enjoyed the beautiful natural setting of the town. The Carleton Place Canoe Club is situated at Riverside Park along the Mississippi River, and is Canada’s oldest continually operating Canoe Club. Formed in 1893 as the Ottawa Valley Canoe Association, it is one of two existing charter members of the Canadian Canoe Association. The town has a proud military history. The first settlers gathered for annual “musters” and in 1822 their numbers were deemed sufficient to summon them as a militia regiment. They were designated the 4th Regiment of Carleton Militia, later known as the 3rd Lanark Regiment. In the First War, Carleton Place produced more fighter pilots than any other Canadian town of its size, including Arthur Roy Brown. Captain Brown, flying with the Royal Air Force, is crediting with the downing of German Baron von Richthofen, “The Red Baron”, in 1918. Carleton Place was home to several high tech and research companies beginning in the 1960’s, including Leigh Instruments, which manufactured the Crash Position Indicator, better known as a “black box”. Today, the town of Carleton Place is a thriving town of 11,000 residents. Visit the Carleton Place Public Library for more information, or access their Local History website. Visit Heritage Carleton Place for more local history, photos and stories!